Yes, it does have vodka in it. You cocktail geeks who roll your eyes at the mention of vodka need to get over yourselves. Vodka does serve a purpose in the cocktail kingdom as a good workhorse spirit to cut stronger flavors or to just add a kick of spirity fire to juice. . .Vodka has been a beloved spirit for hundreds of years. Stop the eye rolling and start the chilling out. We all need to relax and love a bit more. 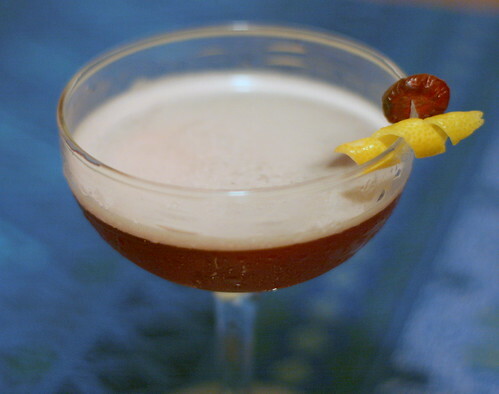 Shake and strain into a chilled cocktail glass, and garnish with a lemon twist and dried cranberry. The name for this drink was decidedly more difficult to come up with than the recipe was. We thought of -- and fortunately discarded -- some truly horrendous ones, such as the "L'il Cran-Teani", the "Jersey Lillet" (since we talked out the idea of green tea-infused vodka and cranberries while riding a bus on the New Jersey Turnpike), the "Don't Stop Tea-Leavin'", and (worst of all) the "Cranheim Tearoller." This was one of the few names we came up with that didn't make us cringe, and is a nod to the Japanese green tea and the very French Lillet. Thanks for participating! 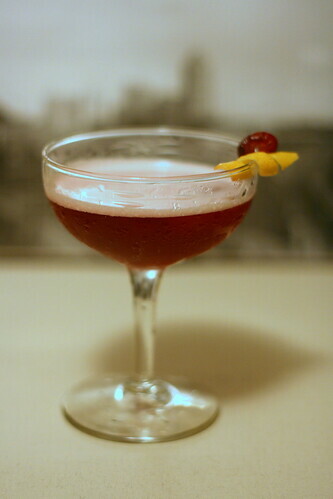 Check our blog tonight for a Mixology Monday round up. Or tomorrow, depending on how much I drink while I write.